The SMA is a unique instrument with capabilities that are well matched to the often challenging requirements needed for solar system astronomy. With up to 8 GHz of total bandwidth, coupled with high spectral resolution, the SMA allows deep continuum sensitivity for imaging small and cold solar system bodies, as well as allowing observations of a multitude of spectral lines within a single tuning and enough spectral coverage to include even highly pressure broadened features. Solar system spatial scales range from about 1 arcminute (or larger for cometary comae) to well below 1 arcsecond. The SMA antennas have large primary beams suitable for imaging large fields, yet can pursue very high resolution (to below 0.2 arcseconds at 345 GHz) by moving the antennas to over 0.5 km separation. The SMA supports a small yet world-leading program of solar system research, producing pathfinding science on a variety of topics. In one sense, science research within our solar system is as diverse as the number of objects we can observe, as each planet, moon, or small body represents a unique world to explore. SMA solar system science can be broadly broken down into two categories: (a) research dedicated toward understanding the properties of solid surfaces, and (b) research toward understanding the properties of atmospheres in its broadest application. The SMA is adept at both. On the following page is a listing of SMA projects that have been pursued in the past 5 years (with PI and year when observations were obtained). Ceres - Observations of nearly one full rotation, showing almost no variation in brightness temperature with longitude, and thus a very uniform surface in both mm and OIR bands (Moullet & Gurwell, 2009). Figure 02: Complex chemistry in Titan's stratophsere produces hydrocarbons and nitriles. While most nitriles can be observed and mapped by CIRS on board the Cassini spcecraft, the distibution of acetronitrile CH3CN can only be obtained from ground-based spectroscopy. 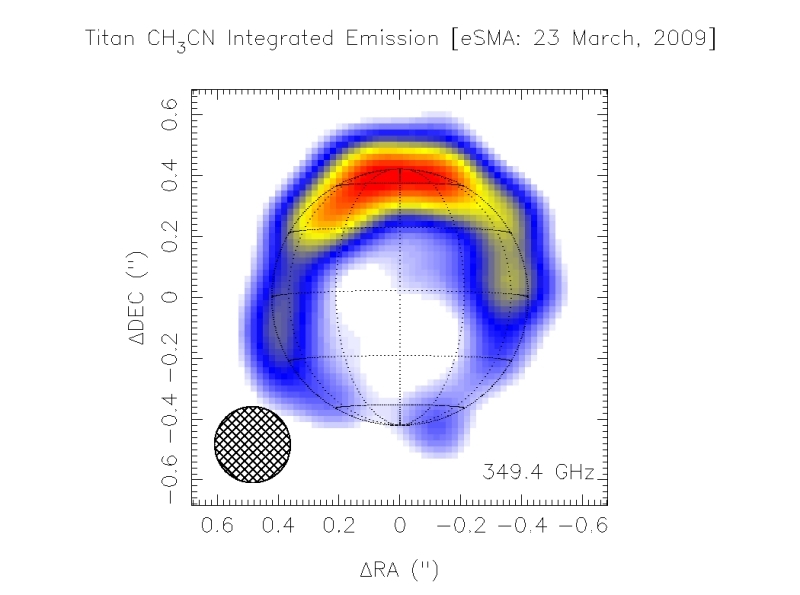 The CH3CN line at 349 GHz was observed in 2009 with the extended SMA (eSMA) mode. The exquisite 0.2-0.3" resolution produced by the eSMA (SMA+JCMT+CSO) is necessary to sufficiently resolve such a small source (0.8"). The increased abundance of CH3CN at the North Pole is consistent with the distribution of other nitriles. Doppler-shifts indicate a prograde zonal circulations. Strong seasonal variations of abundance and distribution are all assessed (Gurwell et al. 2009).